This week's tech tip has to do with time management. This is something that we either have no problems with or it is something that we struggle with. Some days, I feel like I do really well managing my time and my tasks. Other days, it seems as though I've not been very productive at all. So, how can this tech tip help you out? Since converting our accounts to google, we've tried to help you along the way with google mail, google docs, and google calendar. One little thing that is often overlooked in google is the ability to track your tasks. Task it a little notepad that resides on the right side of your google calendar and/or google mail. I find myself using it more and more for little reminders, notes, or something that I need to do. When done, I can check it off and continue onto my next task. 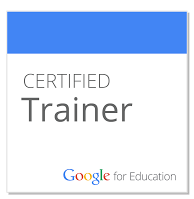 It is pretty simple, yet robust as it syncs across all my google apps. So, if I am using google mail, then decide to switch over to calendar, my tasks are right there with me. 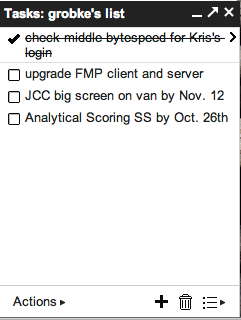 Below is a screen shot of my task list as well as a link to how to get started using google task.